Q: Valtteri, your third victory of the season, but surely the most important day in your racing career. In a straight fight you've beaten a four-time world champion, same car, same day. Pole position, fantastic start and you absorbed a lot of pressure? Valtteri BOTTAS: It is a really important win for me after having a pretty difficult start to the second half of the year, working hard on all the issues and getting better and better with everything. This weekend, just, pole and win, couldn't be happier to end the season like this. Again, congrats to Lewis for the title and congrats to Sebastian for the second place in the championship. I was third this year, hopefully better next year. Q: Tell us what was going through your mind when Lewis kept closing the gap and then you were just managing it. I saw one tiny error down at the bottom of the hill, but you seemed to have it under control? Bottas: You know, I was really managing the race, and that way the race, that was the feeling and that was a nice feeling. I had one bit of a lock-up when I was approaching one of the lapped cars, but otherwise no issues. In the last five laps I started to go a bit quicker and managed to build a gap, and really pleased. The car was so good. Again, for this season: team, thank you very much, I've really enjoyed it. Q: Valtteri, congratulaitons. Lewis, you're not used to second, but you gave it everything today it looks like? Lewis HAMILTON: I did. Big, big congratulations to Valtteri, he did an amazing job today to hold me off. But it was a great race. I just gave it everything, every single lap. It's very, very hard to overtake here, so once you get to last sector I struggled, but I gave it everything. I just want to say a big thank you to the team, both here and back at the factory. What they've produced for us this year is just incredible. It's a real honour to race for them. And then to have this amount of support here, thank you everyone. All the British flags, I love you and appreciate you. Looking forward to coming back strong next year. Q: Sebastian, you secured second in the world championship but pretty lonely race for you? Sebastian VETTEL: Yeah, it was. In the beginning I tried very hard and I think I had as good start but then nowhere to go. I locked up a little but and flat-spotted the first set of tyres a tiny bit with that. But then, after three, four, five laps I just couldn't go any faster and they seemed to pull away and from there onwards it was pretty lonely. But then I have to say, in the second stint I really got into the car, got into the rhythm and I think we had stronger pace in the second part of the race. But not good enough to match those two guys. Congrats to Valtteri, very happy for him, and again, very much congratulations to Lewis on his season. He deserves to win the championship this year, in the end. I hate to say it, he was the better man, so I'm sure we will do our bit over the winter and hopefully come back stronger. Lastly, thanks to all the fans, the support for Ferrari has been incredible, so thank you very much. Forza Ferrari. Q: Valtteri, you're quite reserved in showing your emotions but we saw some clips of your family in the pits as you were coming across now, what's the feeling now, this sets you up for a great winter ahead of next season? Bottas: You know, we Finns don't maybe show emotion but it doesn't mean we don't have any. I'm so happy, there's been so much support from my family and everyone. I can't show it too much, but I feel good. Q: Valtteri, think back to this race 12 months and how much your life has changed since, in unexpected ways. You're a three-time race winner and do you feel now that you know what it takes to fight for a championship in 2018? Bottas: Yeah, it is crazy to think that last year I was still here with Williams, knowing as a fact that I'm going to be driving 2017 with Williams, and now I'm here, winning a race with Mercedes. It's a bit crazy, but life is. It's been an incredible season for me in terms of how much I have learned with this team, with Lewis. I think every single race I've always been able to find something, especially from the tricky ones. Just based on one race win at the end of the year, I can't say now that I know how to win the title. I've never done it before. I just need to go next year race by race but for sure this weekend gives me a lot of confidence. I had a good performance in the qualifying and today was very good. I'm really looking forward to next year and seeing what it brings but I will be working as hard as I can over the winter and I'll try to have a strong one. Q: Well done. Lewis, you seem very happy for your team-mate with his pole position and his victory this weekend. I guess there's another side of the coin, which is you never want a team-mate to feel too strong going into next year's championship. So is it a case of 'well done, Valtteri, but in Melbourne next year it will be business as usual from Lewis Hamilton'? Hamilton: For sure. I think Valtteri did a great job this weekend, and also this year. To come into a new team is always difficult. It's always a challenge to acclimatize, to get used to new people, new ways of working, so I think he's done an exceptional job and to finish on a high is great. I think it was great to have the race that we had today as well. He didn't really make any mistakes. I think we both had one mistake in the whole race. A lock-up for me in 17 and for him in Turn 5 but otherwise pretty much perfect, so and obviously with that pressure he did exceptional. But also for me it feels like a win for all of us. It's a 1-2 for Mercedes, it's a very strong win against Ferrari this weekend and we mean to continue next year. Of course going into next season, it's back to business, but excited for the challenge ahead. Q: Sebastian, I bet it's nice for you to have some company after a fairly lonely afternoon for you. At the end, 19 seconds the margin, but pretty much the same pace as the Mercedes when you got onto the supersofts. What does thus result say about you and Ferrari's challenge as we close the championship? Vettel: What do you mean what does it mean? Q: This isn't really representative of the way you're ending this season? Vettel: Well, it's a race. We took it all very seriously, so I think it's serious. I think we had a strong year overall. Obviously we didn't win, neither the Drivers' nor the Constructors', so we can't be happy with that, because [it was] what we generally set out to achieve. Overall we were not quick enough. Simple as that. In the end you can break it down to a lot of details and this and that but overall the package wasn't good enough but I think the positives outweigh the disappointments we had here and there over the year, because you must not forget where we have been 12 months ago and the incredible achievement that's come together over the winter to set up this year, and throughout the season to keep improving the car, the engine, so a lot of work but overall but we saw today that we got a fair beating and couldn't touch them in quali and in the race, so obviously there is lots for us to do better. Q: (Heikki Kulta - Turun Sanomat) Congratulations Valtteri for the victory. Finland will be 100 years old in 10 days' time. Is this some kind of present for your home country? Bottas: I don't have any other presents, so let it be! Let this be the present. Obviously, I'm a very proud Finn, very proud of where I come from. So, now for me it's a great opportunity for me to say Finland happy 100th birthday very soon. I always love driving under the Finnish flag and for all the people in Finland supporting me. So yeah, very proud. Hamilton: [to Heikki] How old are you? You're one of the first Finns! Q: (Luis Vasconcelos - Formula Press) For the two Mercedes drivers. Lewis was faster in sector one and sector two for most of the race and Valtteri, you seemed to have a big advantage to make it all up in sector three and still gain a bit more. Was that a setup thing? And in Lewis' case, you said you were not very happy with the changes that you made for qualifying. Did that reflect as well in the race, that you couldn't get close enough and were losing on a sector where, traditionally, you're very, very strong? Bottas: I think, yeah, I could feel that sector three was good for me - but also it's a track where it's really difficult to follow in sector three. Once you get close there, I could feel with the lapped cars, how much you lose. I knew that Lewis was always going to be struggling as he got closer to me in sector three. I think Lewis has been strong all weekend in sectors one and two but for sure I think also the slipstreaming can help in the long straights for sector two. But yeah, for me, I could really control the race, everyone knows here it's not easy to overtake. Q: (Peter Windsor - F1 Racing) Sebastian, you make the car look great through the first sector, where I was watching the quick corners. I'm just wondering in the first stint where the Mercedes did get away from you. Was it a power thing perhaps, which translates into downforce or sector two, maybe sector three? Vettel: Well, the first two laps were pretty good, I was able to follow and I thought, 'OK, I can stay with them', and it became apparent that in particular, I would say, the beginning of the second sector, the section around Five, Six, Seven, I think Five and Six they were faster than us all weekend. Straights, I think you benefitted from the tow even if you're a bit further back to I don't think it's fair to say that they gain all the time in the straights. In the last sector they were very strong, so even if Lewis had to follow Valtteri closer than I was to Lewis, he was still faster than me in the last sector. So, I think that's where it got away. I think in the final stint on the supersoft, overall we were more competitive, I felt happier with the car all around. So yeah, I just couldn't... I hovered in terms of lap-time it was pretty much the same until the end of that first stint for us - but those two in front, they were able to just go faster with the fuel going down. That's something I couldn't do. Q: (Flavio Vanetti - Corriere della Sera) To Lewis, first of all, which was, by your opinion, the key point of your season? The key aspect. And to Sebastian, with a victory in Singapore maybe you would have had scenario and maybe the story would have been different? Hamilton: I'd say the key points were... I'd say probably the first half of the season was maybe a little bit up and down in terms of extracting maximum performance out of the car. I think the Ferraris seemed to be a lot more consistent in that respect. I think in the second half the studying and the understanding of the balance, being really able to hit the nail on the head most weekends and get the car where I was able to exploit the car's potential and my potential on a consistent basis was really a part of it. And of course, with that pressure applied, a bit like today's race where you know, often in a difficult race like today, you're applying the pressure, hoping that you can squeeze a little bit of a mistake from the driver ahead. It's the same, I would say with the team: when teams are pushing right to the limit, you're pushing, you're squeezing every drop from the car, yet you've got to make it go quite a long distance in terms of life and reliability. I think that's really where the stamina, I would say, of Ferrari was not the same as Mercedes. Nonetheless I think they had a great car and an incredible season and looking forward to the tough battles that we're going to have next year. It's going to be interesting to see what people turn up with on the first race - or the first test. But yeah, the second half of the season was really the turning point for me. Vettel: Yeah, for sure it makes a difference, if you finish a race rather than finishing it in the first lap but overall I think we had a good year. You have to be also fair, in the end Mercedes was better, they were faster - look at the amount of pole positions, of race wins. I think we had our chances, we used them, we had races were we probably got away with a good result even though it was on the edge. I'm thinking about races like Bahrain where we were very close to have a failure. We won the race in Hungary which I don't think we were supposed to win with the steering failure we had during the race. We finished races that might as well have been, could have been a DNF. On the other hand we had other races where we didn't finish. It's obviously bitter because you're not in the fight. That's the frustrating bit about those races but they're part of racing. So, that's how it does sometimes. In that regard obviously Mercedes has been more consistent. The issues that they had, thinking about gearbox at the beginning of the year were less costly and happened to them on a Saturday or early in the weekend - but that's how it goes. Overall I think it's a straight fight and they just did better but again I want to emphasise the positives for us. Really the steps we were able to make. The way the team has grown together. I don't think you always see the full picture. Maybe we are less vocal about it than other people as well - but in the end we do our job, and that's what bought us here in the first place. If we keep doing that I'm confident that we can be in a better place next year. Q: (Dan Knutson - Auto Action, Speedsport) Valtteri, you said you had things under control but was it tense in the cockpit or were you feeling kind of relaxed because as Lewis said, he was keeping the pressure on you? Hamilton: He's a Finn. They're just ice cold the whole time. Of course he's so super focused. Bottas: Of course he was close by all the time. I knew all it needed was one proper mistake and of course he wants to win so then he will take the opportunity. So I just needed to focus on my things really and get my stuff done. Go through the race, corner by corner, lap after lap. There was no panic at any point but of course I knew the facts but you only need one mistake. Like Lewis said, I think we both had one bit of a lock-up which can happen, I guess, but luckily it wasn't too big a one. 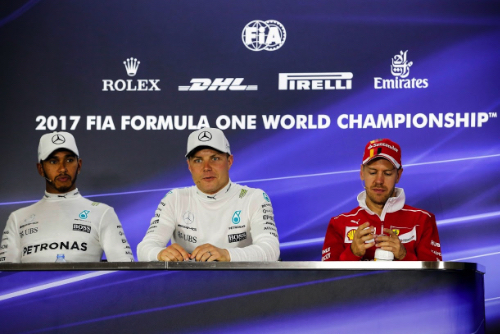 Q: (Angelique Belkopytov - AutoDigest) Question to all three of you: finally on the podium we saw the new F1 logo. What is your opinion about that and do you agree with the change? Bottas: I kind of like the old one. I only saw it very quickly. Vettel: Just say you don't like the new one! Bottas: What's wrong with the old one? I don't know. I think it's quite cool. Vettel: I liked the old one better. Hamilton: The problem is logos... I think the one that we already had was an iconic logo I think. Just imagine Ferrari changing their logo, or Mercedes changed their logo. I don't think the new one is as iconic but maybe it will grow on us. Q: Lennert Wermke - Bild) Niki Lauda just retired as a TV pundit after 21 years with RTL; he just told the people live on air. Can you share some special memories with Niki being a TV expert with RTL? Vettel: Well, he's certainly been straightforward and direct and just himself, I think that's why he had the job for 21 years you said? I'm sure he will be keen to give some answers also in the future, not worried about that but yeah, obviously he decides for whatever is best for him so... I don't know. I didn't hear all the stuff he said about me which maybe is good or sometimes is bad. Yeah, I think we've all been praised by him on TV and all been... the opposite of praise by him, live on TV. As I said, I think he's very much appreciated for the job that he did because he's outspoken and straightforward. Hamilton: Yeah, Niki's... I hope he stays with us in our team but Niki's been such a big influence or positive within the team and I think it's great to have someone who is so informed about the sport. He really has a great great mind, the way he still thinks today, similar to how he raced. He's got a great racing mind so to be able to... the benefit, for example, of him being on our team is having someone who understands what it's like to be in the heat of battle, to make mistakes, to be on the limit, to push the car to the limit. He's a real positive in our team. He's always pushing, we need more time, we need more power or we need more downforce. He's still pushing as if he was racing which is great. I've only ever heard positives from people who have been watching him on TV and the great thing is that he doesn't beat around the bush like some may. To be honest, for me, he's the legend in the paddock and he will continue to be. Bottas: Yeah, I really agree with Lewis. We are lucky to have him in our team and every team needs at least one person who says things completely as they are and Niki is one of those persons and I think for the TV that can sometimes create some headlines, I think, but yeah, a lot of respect for Niki. I haven't really focused much on who is working for which TV etc but just happy he's on our team. Q: (Heikki Kulta - Turun Sanomat) Lewis, you won your first championship with a Finnish teammate and now this one with Valtteri. How different was the challenge that your teammate presented? Hamilton: Err, as opposed to the previous time you mean? I mean, Jeez, that was a long long time ago, man. I think he still had grey hair then but... I'm kidding. I'm messing with you. I don't really remember. I think they've both been... I got on really well with Heikki. We both were into golf at the time so we also had a really good relationship and I think it was definitely a transitional time for both of us and maybe a more difficult time in our lives because we were both younger and I would say for Valtteri and I, we are obviously older and wiser and more understanding of who we are and what we're here to do and about the business and work ethic and all those different things. This has been an enjoyable... what I can say is that Finland always produces fantastic drivers and it will be interesting to see which Finn is coming next but at the moment you've got Valtteri at the forefront so I am going to work as hard as I can to keep him behind. Q: (Darya Panova) How can you describe this season in just one word? Hamilton: One word... I mean epic? It's kind of been epic, it's kind of a boring word though isn't it? Is there anything else, a better one? Historical? That's kind of old. Can someone help us out? Hamilton: You're confusing me now. Q: What he means is that when you've wrapped up the title early, you've not gone on to win a race afterwards in that year. Hamilton: I've won a race in every single season. Q: (Graham Caygill - The National) What I mean is after you've won the World Championship, in the races afterwards, because Nico won the last three races of 2015 after you wrapped it and Seb won in Brazil and Valtteri's won here, so just really, I'm just wondering... because obviously it's not a big problem but I'm just wondering, was it just circumstances led to that, means you don't win after you've won the championship or do you think maybe your level does drop, maybe sub-consciously? Hamilton: I think in previous years it probably dropped more than this year. I think this year I've tried my hardest to stay more on it but I was doing other things, yeah, celebrating a lot so... I think I still drove relatively well but yeah, I wouldn't say it was a hundred percent like it was whilst in the season. What can I say? When you've won you win, doesn't matter with two races to go at the end, you've got to enjoy it so I do and try and still turn up and do the job. It's just not so easy. Q: (Peter Windsor - F1 Racing) Lewis, what was the grip like on your side of the grid? Hamilton: It was pretty good. I think it was quite equal. It felt like I got a slightly better initial getaway but then I got wheelspin which is always... I think it was just... I was too aggressive on the power or whatever. We were quite close into turn one but that little bit that I lost there I lost... we'll look obviously, at the end, but I probably lost a good couple of meters. But I think it would... as I said, this is such a great place to have a Grand Prix. It's such a beautiful place here in Abu Dhabi, everyone has such an amazing time. If there's any way we can improve this track to enable us to have these battles... you've got these long straights where you can't even get close enough to utilise them. If there's some way where we can enable us to be able to remain closer in that third sector, I think this will go up in the rankings of a great circuit. I don't know if they can do it but I know there's money to do it but I just hope... I have hope for Abu Dhabi to get better. Q: (Ysef Harding) It's time for the holidays, it's time to take a break for a minute. What do you guys have planned during the off-season? Hamilton: Sorry, there's a fly on you. Bottas: What did I say? Where was I? So it will be nice to have some time without thinking of Formula One, because everyone in this sport... it's so intense, needs it, so definitely it will be nice to spend time with the family and for sure going to visit Finland. Vettel: They call me Mr Miyagi as well. Probably find something to drink tonight and then sober up tomorrow, do the test, after that not much break. Obviously we've got work to do so I'm happy for them to go to holidays but we won't. Certainly around Christmas there will be a bit of time to relax but yeah, I think we want to be in better shape next year so work on that and obviously, as I said, for the team it's flat out from now, already the last few weeks it's flat out. I think people are generally mistaken by... I don't know, I got a weird call the other day at breakfast and here obviously the race happens later so I had breakfast at ten and there was a guy who said 'I didn't know that Formula One drivers had such a relaxing life.' I don't know what normal people do when they have breakfast, if they are running or exercising, so I don't know. I didn't get his point but I think generally if you think that from now until March we sit around questioning ourselves what to do. There will be some time to do some stuff that we'd like to do, follow some hobbies, get time at home with friends, family but yeah, I'm very hungry for next year. Hamilton: Yeah, I think it's quite incredible how people might not realise but it is obviously a very long season for all of us, both for a racing driver and for a team. It's very physical, there's not really a lot of break. Whilst we're not racing, you quite quickly have got to start turning around and preparing for the next season. A bit like Valtteri said, I don't get a... I'm not going to be on my break until I think it's 18th, 19th and then get to have Christmas with family and stuff but again, the cars will be faster next year, training needs to go up, efforts need to be doubled and so then you've got the winter testing that comes in, still quite a lot of appearances left to do so yeah, it doesn't really seem to stop. Obviously we're testing already for the next season in two days so it's just crazy, Formula One just doesn't sleep, it just keeps going, keeps moving on into... immediately now, development on this car's already stopped probably some weeks ago and they're already developing next year's car and it will continue. The guys back in the factory are already 100 percent onto next year's car. As soon as this day's done, we are 100 percent focused on doing next year's so that's why Formula One... I mean particularly with these long seasons, it's more and more demanding and harder and harder to do long spans like Felipe has done for example, Michael did. I'm looking forward to next year and like these guys, I know they're going to be working to be fit and ready so I'll be doing the same.